Let me be the first to say that no matter how much you disapprove of my adoring your mouf, I will continue to do so! This is very true Tommy but I still want to snorgle you no matter how much you Disapprove! Ijon, you might be a little too sassy with that bun for your own good. If he calls you on your bluff and actually disapproves all he likes, well, I just don't want to think about it. You thrill seekers! I hope the sensation doesn't get too painful. In 10th to the 100th years from now matter (atoms to be specific) is supposed to decompose into protons and neutrons, etc., so I wonder, would this affect disapproval being emitted into the universe as we speak? Anyway, how bad could it be? Just look at that mouf. "Anyway, how bad could it be?" I knew a Tommy. We called him Tommy Salami. Tommy Gun. Tommy - wants - his - mommy. I would never dare say these things to THIS Tommy. 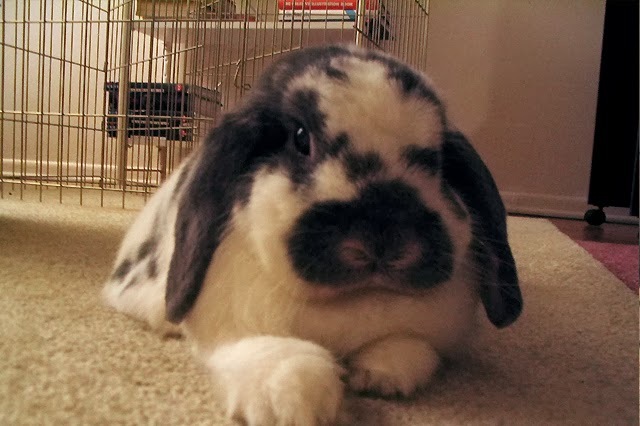 He has one of those highly-beepable lop nosies! It's pretty much impossible to resist! And I wanna kiss his forehead! And I bet his belleh fur is just *so* cute; I'd have to SWWWIHBF ! You know we used to be concerned about SUTTR. I think it is time to worry about BEING sucked up by the rabbits. Fleetie, it is good to have you back, but you come bearing temptation suggesting behaviours that I might or might not live to regret. You'll be fine. The bunnies love you, but me...doomed for sure. Thank you for reminding me of SWWWIHBF. Sometimes we just forget to stop and smell the belly fur. I don't know who is in more danger, me or Tommy.